Hot-shot Andy Waterworth saluted manager David Healy after Linfield’s Tennent’s Irish Cup Big Two win at the Oval on Saturday. It was the 30 year old striker who bagged the priceless extra-time winner, but it was Healy who made two big decisions that ultimately helped ease his team over the finish line. The first of those was a double substitution in the form of Ross Gaynor and Kirk Millar. Within two minutes of their introduction, they combined on the right to create an equalising goal for Stephen Lowry, who volleyed a beauty past Elliott Morris. Healy’s second major intervention was to persevere with Waterworth, who was pleading to be replace after tweaking a hamstring. And, just before the boss ordered Sean Ward to warm up, Lowry somehow wriggled his way to the by-line and crossed for Waterworth to ram home. It was his final contribution. “The gaffer said he knew there was a goal left in me,” quipped Waterworth. “I knew Stevie would cut the ball back, so I made sure I was inside the six yard box. I’ve been playing with him long enough now . . . I know what he was going to do. “I just got in there as fast as I could and thankfully it paid off. “But I was out on my feet at that stage. I’ve been carrying a wee injury and my legs were gone. I told the gaffer, I need off because I was giving him nothing, but he told me to say on for four more minutes. Waterworth admitted he couldn’t believe his eyes when his effort in the first half rebounded off the inside of the post. He added: “I thought it was in, but the ball took a bobble on the turf right at the post. “It was Stevie (Lowry) again who set me up. I was ready to celebrate when the ball took a nasty bounce. I thought at that stage it may not be our day. “We are through to the next round and that is the most important thing. We probably did it the hard way, but we’ve had loads of games of late and there were a lot of tired bodies. Blues chief David Healy preferred to deflect the praise of his inspired double substitution. “You take the flack when the don’t work,” he smiled. “But the credit goes to the players that come on. They are the ones that make the difference. 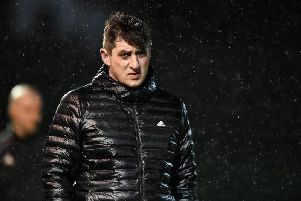 Glentoran manager Gary Haveron admitted his boys came up short when it mattered, especially after Curtis Allen has shot them into a first half lead. “Too many times this season we’ve been in a winning position and failed to get over the line which is disappointing.